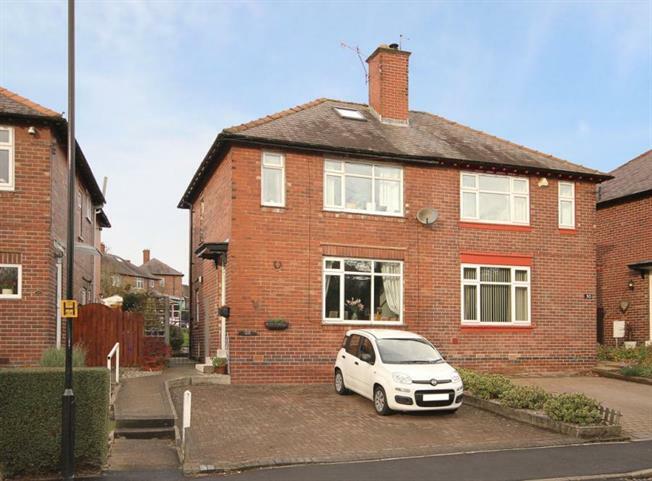 3 Bedroom Semi Detached House For Sale in Sheffield for Guide Price £250,000. This opportunity is not to be missed for this attractively presented three bedroom semi detached family home having a conservatory to the rear. Conveniently located within this desirable residential area of Totley, close to reputable schools and ample local amenities. The accommodation offers a gas central heating system via a combination boiler, uPVC double glazing, as well as benefitting from a double front driveway and a good sized well maintained and enclosed rear family garden. The accommodation in brief comprises: Side entrance lobby with laminate to the floor and stairs rising to the first floor and a door leads into the front facing lounge also having laminate to the floor, attractive fire surround and electric stove. Dining kitchen, fitted with a range of attractive wall and base units with integrated appliances to include electric hob, oven, extractor fan, fridge and freezer. Tiling to the splash backs, porcelain tiled floor, built in storage cupboard housing the gas boiler (recently replaced) and a utility cupboard provides space and plumbing for the washing machine. French style doors access the conservatory also having a porcelain tiled floor, tinted glass roof, side and rear facing windows and French style doors accessing the rear garden. First floor landing: with door to Master bedroom with attractive cast iron feature fire surround also having a pull down ladder accessing the occasional loft room, being carpeted, with both front and rear facing velux windows as well as storage to the eves. Double bedroom two overlooking the rear garden and front facing single bedroom three. Family bathroom having a three piece suite in white comprising wash hand basin, low flush wc and bath with mixer tap shower attachment. Also having tiling to the splash backs and tiling to the floor. Externally: To the front of the property is a double block paved driveway, a side gated pathway leads to the rear enclosed good sized family garden, being lawned and well stocked along with apple trees, a decked terrace, summer house and patio area. This well presented property must be viewed to appreciate the quality of accommodation together with its location. Positioned on the edge of Sheffield within reach of Dore and Totley station therefore ideal for the commuter for access to Sheffield and Chesterfield. Ideal for countryside in Derbyshire and the Peak District and within easy reach of ample local amenities. Reputable schools are close to hand including Totley primary school, Totley all saints school and King Egbert's comprehensive.